Forrest M. Mims III is a trusted name in the electronics world for good reason: his charming and engaging texts have drawn millions of people into the world of electronics for the first time. Star Simpson has created an electronic tribute to those hand-drawn circuits by bringing the projects to life. These kits are an exquisitely designed series of finely crafted and highly detailed boards. These are the Circuit Classics. They make a great gift for a first-time learner, an expert tinkerer, or even just as a fun conversation piece for your desk. 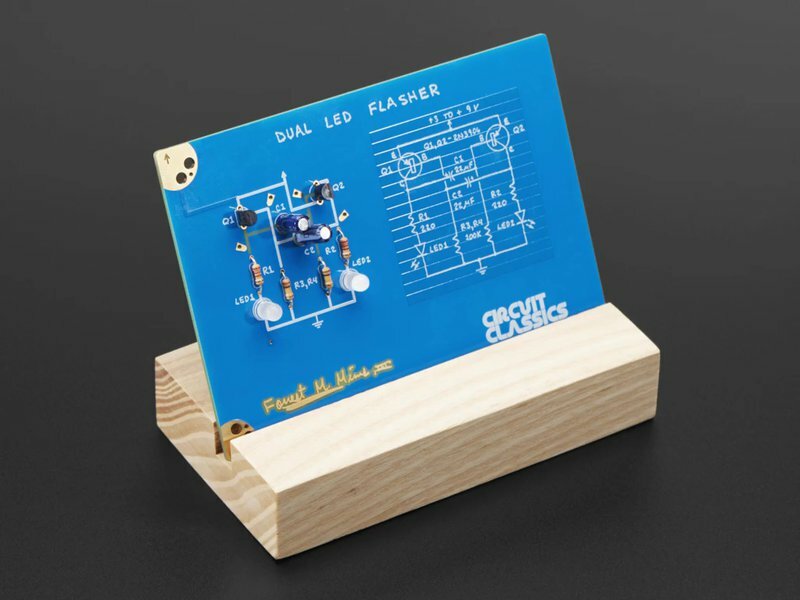 Three of Forrest's circuit designs are available in kit form: the Dual-LED Flasher, the Stepped Tone Generator, and the Bargraph Voltage Indicator. Beautiful blue Printed Circuit Board (PCB): Includes the circuit itself, the circuit's schematic, and a description of the circuit, all in Forrest's iconic hand-drawn style, traced directly from his books. Through-hole Components: All the components you need to build a working circuit. 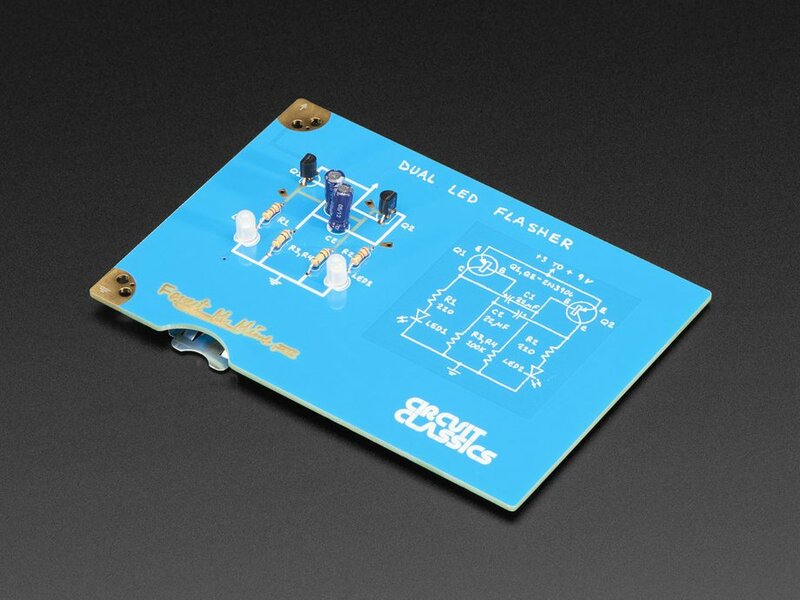 Easy to place and solder on the PCB thanks to clear footprints and large, friendly solder pads. Display Stand: made of high-quality blond ash wood, each stand is crafted to let you proudly display your work. This kit is the Dual LED Flasher. This circuit is a rewarding first project — with just nine components you can get the satisfying effect of making LEDs light up and blink. The functionality of this kit from Circuit Classics is charmingly complex despite its simplicity. 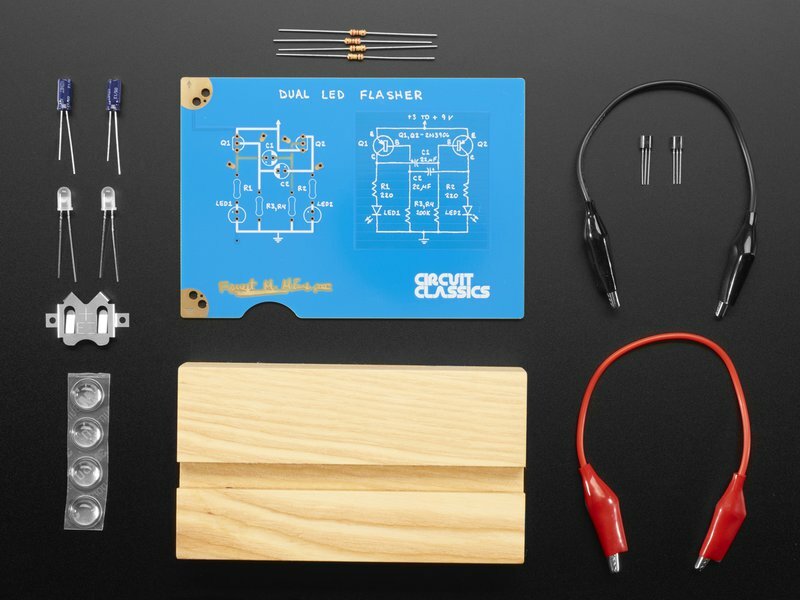 Understanding how it works will provide a taste of the analog side of electronics, and is a fun puzzle! You'll need a couple of additional tools and materials in order to put this kit together: a soldering iron and solder. You can use the included wooden stand to hold the board while you solder. Please note: Batteries are not included in the kit! You can choose to use the provided alligator clips to hook up a 9V battery or power supply of your choosing, or you can assemble the SMT Battery Clip to the reverse side, in which case you'll want to pick up a 3V 2032 coin cell battery. PCB Dimensions: 127.25mm x 89mm x 1.75mm / 5" x 3.5" x 0.06"